It’s the best day of the week! Friday! Do you have any plans? It’s been so cold here lately so I am going to stay cuddled up. With a movie or a book or something. As you can see, I have 2 coats of Tip Top – Armour plate on my index and pinky and 2 coats of OPI – Push and shove on my middle and ring. No topcoat on any. Armour plate is a foil and Push and shove is a chrome. Push and shove is much more reflective and ‘shinier’ but Armour plate is much more forgiving. Push and shove is inclined to show any little flaw on your nail. It’s still super gorgeous though and totally worth it. Armour plate looks quite foily but when you add topcoat it does smooth out quite a bit. Both of them apply really well. Look out for them in a Tuesday Stamping post pretty soon too. 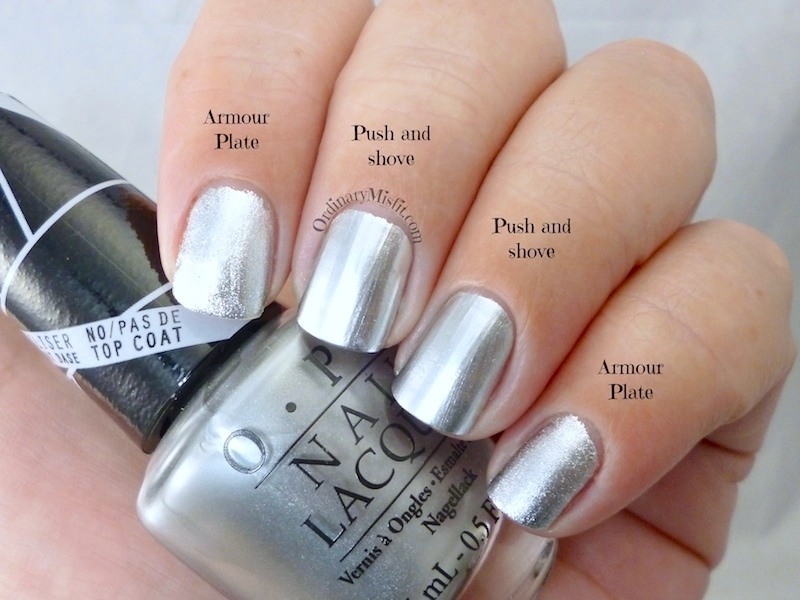 Do you like silver polish? Which one would you prefer, the foil or the chrome? Or both? I really like both. Both of these are favourites in my collection. I want both! I love Armour Plate and I use it for stamping a lot but Push & Shove is just so unique and shiny! Painted Fingertips recently posted…The Neverending Pile Challenge: Dupes! Armour plate has and always will be a favourite of mine too. Push and shove is so different and the closest mirror finish polish I have. I’m actually still looking for a reflective chrome silver polish! They are so hard to find. I believe China Glaze Millennium is really good but near impossible to find here. Thanks for the comparison. Great to see them side by side. Hard to picture the difference in my head.